Consumer-Driven Church. . . We Need A Fixing. . . In the past, I’ve been accused of being critical of the seeker-sensitive, seeker-driven, and seeker-centered approaches to what some people call “doing church.” That’s accurate. I have been. My motivation – I hope – has not been driven by anything other than an effort to stand back and examine the contemporary church in light of contemporary culture. I don’t pastor a church so I can’t be angry at or jealous of others who are leading at places where numerical growth is lateral (people coming from one church to another). Rather, my critique has come from my understanding of the Scriptures, how the Scriptures define the life of discipleship, and trends in contemporary Western culture. Overall, I’ve increasingly been unsettled by and lamented the fact that attractional methods are sought and employed – with good intentions, by the way – to draw in the greatest number of people so that they might hear and respond to the Gospel. In the end, I wonder if that does more harm than good to the cause of the Gospel and spiritual growth. I love the church. CPYU exists to serve the church. And, we are always working to promote deep spiritual growth in Christ in a world that promotes consumerism. So, when we see things that might be troubling and that need to be considered, we’ve worked to raise those issues directly, but with sensitivity. Until now, my company in concern over the market-driven approach to church has been traditionalists and friends in the emerging church movement. . . who tend to recoil against what has been mainstream consumer-oriented Evangelicalism. But over the weekend, I read a very refreshing and thoughtful book from a couple of pastors who passionately and single-mindedly lived on the inside of a movement that they are now trying to convince people to move out of, and into deeper things. 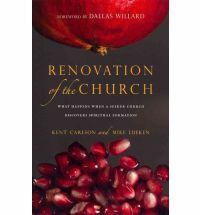 Renovation of the Church: What Happens When A Seeker Church Discovers Spiritual Formation, by Kent Carlson and Mike Lueken (IVP, 2011) captures so much of what I’ve been thinking and wrestling with for years. . . all thought out and framed in ways that states a case beyond what I could ever come up with. These guys had a wrestling match with their deeply-held convictions and their honesty and transparency is refreshing. This book is so rich, especially in its critique, that I could never do it justice by rehashing its basic message. You have to read this for yourself. And by the way, I want to encourage all – ALL – of friends in youth ministry (young and old alike) to read this book. It’s that timely, necessary, and even prophetic. Go at it with your defenses down and a heart prayerfully open to what God might just tell you. Seriously. “How do we present the radical message of Christ in a church that has catered to the religious demands of the nominally committed? In other words, if we have gathered people into congregations by appeasing their appetites and desires, how can we help them deal with the fact that their problems in life and character – even ‘in church’ – are primarily caused by living to get what they want? How can the cross and self-denial become the central fact in a prosperous, consumer culture? How can discipleship to Jesus – in a sense recognizable from the Bible, with the spiritual transformation it brings – be the mode of operation in a thriving North American congregation? 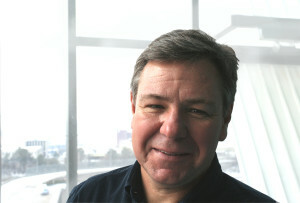 Carlson and Lueken believe that the church in North America is in serious trouble. They disagree, respectfully, with those who point to the rise of the megachurch and other external successes as indicators of a robust Christianity. They want to see the church reformed. The fact that they are insiders rather than outsiders in terms of where the reforms are needed carries lots of weight. The issue and the passion with which the authors address it kept me from putting this book down. It’s a good one. It’s needed. And if you’re tempted to write these guys and their message off. . . don’t. . . at least until you’ve read Renovaton of the Church. Consumerism is what drives us. It’s driving us in the church without us even knowing it. It’s bringing someone great joy. . . and it’s not the someone who should be joyful. ← What Do You Think About Lady Gaga’s “Judas” Video? . . . .